[One day trip bathing] 11:00 to 15:00 The adult of 700 yen, child of 500 yen It is attached to an unfixed Closed and is verification by telephone required. In spring, the person average which goes the sidewalk in front of an inn showed the prosperity which makes a line also from a weekday at the time of cherry blossom viewing.In Heisei 16, it will be an inn which is in the blessed environment of the isolated lodge in the holy place in Kii Mountains and the "worship way" Yoshinoyama heart of the mountain which were registered into world heritage, and can enjoy the furuyu and dish of rich efficacy.Especially dishes are a genuine article of a dish Ryokan, and a taste of a hand structure.It has been impressed by a soup mouthful whose broth was effective as "the taste of a that's it and a dish Ryokan. "Also as for the intestines which will also select the sweetfish carefully, as for oil, please ride, have substance, as for the trolley of kabayaki, and the trolley of an egg, suit the broiled eel's fillet wrapped in thick omelet, and, also as for the elastic resistance to the teeth of exquisite ! and slices of carp chilled in icy water, taste and look at it.The inn associated with Touson Shimazaki was making the image of those days bear in old-fashioned wooden appearance. 2011/7 / 26 dishes are visited for the second time at a pleasure.Also after becoming a ground of world heritage, it is a daggertooth pike conger. Pueraria lobata Sweetfish Beef Carp The home-made dish which does not change noodles, and the furuyu of free-flowing hot-spring water were offered.A Best recommend is the chawan-mushi of yoshino Kazura unique to the product from the ground. Following Hijikai 畿最高峰, 8 Kyodatake mountain climbing of an ooyamarenge. (Use by the present stopping is not carried out). The azalea garden and wild cherry tree for age-of-a-tree several ten years. They are a wild duck and this wild boar in local wild grass (a bamboo shoot, Pteridium aquilinum, and a chestnut are own account) and river fish (a carp is a sweetfish to a fish preserve in spring drawing-in own account, a red-spotted trout, and summer), local Miwa thin wheat noodles, and winter. * Peony stew is from the room Rates of 14,000 yen. hors d'oeuvre (rice wrapped in persimmon leaves etc. ), a Nakachoku dish (sesame tofu to which Pueraria lobata was applied), a vinegared, thin wheat noodles and rice boiled together with red beans, and the steamed cake of a Chinese yam -- Pueraria lobata -- thick, starchy sauce and a sweetfish dish grilled with salt, and a broiled eel's fillet wrapped in thick omelet (omelet volume of eel kabayaki), slices of carp chilled in icy water, tempura, a boiled dish, a soup, boiled rice and pickles -- all -- a hand structure. Meal place: A supper is a room and a room by the hall and a hope in the morning. Man and woman each 1: It free-flowing-hot-spring-water + Follows, and a part for a fountainhead injection is a burn. One has a fountainhead faucet and a remarkable carbonic acid and metallic taste are felt. 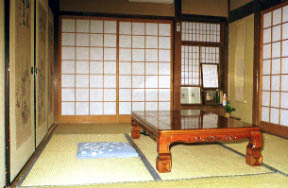 Seven Japanese-style rooms, 30 persons accommodation, a with toilet.